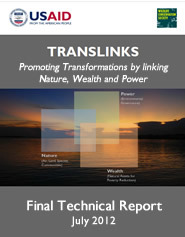 Inspired by the Nature, Wealth, and Power framework for rural development conceived by the United States Agency for International Development and some of its key natural resources management partners in 2002, TransLinks was a 5.5 year cooperative agreement (2006-2012) funded by the Agency to promote rural transformation by linking natural resources, economic growth, and good governance, in partnership with the Wildlife Conservation Society, Forest Trends, Enterprise Works/VITA, University of Wisconsin/Madison’s Land Tenure Center, and Columbia University’s Earth Institute. The program strove to identify, develop, and disseminate lessons, best practices, and tools from the partners’ projects around the world that have attempted to apply the new approaches of Payments for Ecosystem Services (PES) and Wildlife FriendlyTM enterprise/value chain certification to support people living in threatened ecosystems, through conservation and sustainable use of the natural resource base upon which their livelihoods depend. The 26-minute film immediately below presents lessons from six case studies highlighting some of TransLinks' most interesting findings and outcomes. The entire catalog of TransLinks’ products and events is accessible through the folders provided below, sorted in different ways (by themes, product types, year, partner, partner and year) to facilitate finding the materials most appropriate to your interests.